Opening reception: Wednesday, October 29. 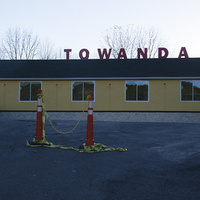 6:30-8:30 p.m.
During the Fall of 2013, 15 students from Parsons The New School for Design collaborated with Documentary Strategies instructor, Vincent Cianni, in an effort to document the town of Towanda, PA through photography, interviews, and video. The resulting body of work, including a series of photographs by Towanda High School students, formed a portrait of a community that expands received notions of documentation, subject, and observation. The project was further developed by a team of graphic designers led by Parsons Graphic Design professor Jeanne Verdoux. The 16 designers collaborated to produce a printed poster-catalog of the project, a live website, and an overall graphic identity that complemented and broadened the scope of the work of the photography students. This exhibition which includes photography, video, and posters continues the project: it highlights the works produced by both photographers and designers while renewing an engagement with the town of Towanda, PA. It thereby forges a new link between rural Pennsylvania and the New York galleries at SJDC/Parsons The New School for Design. "Documentary Strategies and Perception: Building a Picture of Community and Collaboration"
Open daily 12:00 noon - 6:00 p.m. and late Thursday evenings until 8:00 p.m.; closed on all major holidays and holiday eves.